June 16, 2013 (Palomar) –Palomar Mountain Volunteer Fire Department has hired an attorney in an effort to stave off strong-arm efforts by the County, which seeks to force the tiny department to join the County Fire Authority or lose funds. Joining would mean handing over control to Cal-Fire, which runs rural stations under the CFA. The Chief’s concerns appear well founded. According to Assistant Fire Chief Cliff Kellogg, the CFA is having staffing troubles. As a result, he said, “CFA has had as many as six or seven unstaffed fire stations a day throughout the county,” the Valley News Roadrunner reported. The biggest fear is that the mountain could be left completely unprotected during a major fire, when mutual aid agreements could dispatch firefighters elsewhere. 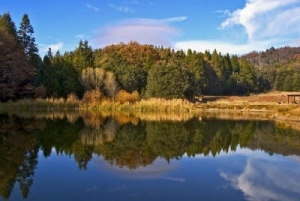 Palomar Mountain’s department is a nonprofit which owns the land on which its station is located. It maintains staffing of at least two firefighters and has operated as a volunteer station for decades. Faced with a June 31 deadline to sign the agreement to join the CFA or lose $115,000 in funds from the county, the department bought time by adopting a one-year contract that it can withdraw from with 90 days notice. Julian, another community faced with a similar ultimatum, staved off the CFA takeover after a resident came forward to offer a donation sufficient to cover the $85,000 shortfall for a year. Disturbingly, despite allegations of Brown Act violations in an alleged closed-door meeting with Julian-Cuyamaca Fire district's board that ECM reported on, a similar closed-door session occurred in Palomar. The Roadrunner reported on May 8: "On Saturday representatives of the Fire Authority and Cal Fire visited the PMVFD board to discuss the contract. They insisted on meeting behind closed doors with the board and threatened to drive back down the mountain if directors let the public sit in on the negotiations, or tried to videotape the conversation. The fireboard acceded to those demands and four hours later reported back to the public, most of who had gone home." Prior to that closed session meeting, the Palomar Mountain district board held an open meeting with about 40 residents, most of whom opposed giving in to the County's demands. Palomar Mountain’s fire board will now weigh options including merging with Valley Center’s Fire Protection District or becoming an independent district. But with only 350 year-round residents on Palomar Mountain, the cost to residents could be prohibitively steep, raising a troubling question: will only communities with wealthy residents be assured of full-time fire protection under the County Fire Authority? Residents have reason to be skeptical. Back in the 1970s the county withdrew from its contract with the state to provide firefighting services in rural areas. After the 2007 wildfires, the county in 2008 moved to form the CFA. But the County has inexplicably failed to write firefighting services into its county charter, unlike other major counties in the state. For example, Los Angeles County’sc Charter in section 24 (http://file.lacounty.gov/lac/charter.pdf clearly establishes the county’s responsibilities for fire protection including brush, forest, and other fires. Asked why the County hasn’t added fire protection to its charter, Supervisor Dianne Jacob, a driving force behind the CFA, told East County Magazine that she continues to believe that efforts to consolidate rural fire agencies with the county Fire Authority will help make our region safer the next time a major wildfire hits. The County has spent over $250 million since 2003 on improving fire protection and has consolidated over a dozen volunteer fire departments. But for communities where stations have gone dark some days and the nearest help is too far away to respond quickly, the county’s assurances fall short of alleviating the serious concerns of taxpayers in remote areas such as Palomar Mountain. Last week, the Valley Center's Roadrunner editor, David Ross, learned first-hand the importance of having swift fire response on the mountain. His cabin (photo, right) burned to the ground after a fire started behind a refrigerator. Ross said Palomar Mountain's volunteer firefighters responded in less than 10 minutes. With no rapid respond, the fire might well have spread, destroying forest lands or other homes. 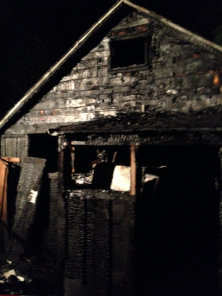 He praised firefighters' efforts in an e-mail to ECM, stating, "They kept my house from being a total loss." As to the absolutely ridiculous Diane Jacob statement in this article "“This is a monumental public policy shift....." A remark like this shows one of 2 possibilities. 1) She does not have a clue as to what's going on. 2) She knows exactly what is going on but hopes you don't. I'd like to hear more details on this. Can you email any suggested contacts who can confirm these details to editor@eastcountymagazine.org? We have a reporter researching all fire districts that have been taken over by County Fire Authority to find out how well (or poorly) it has worked out. Thus far we're finding many problems and complaints. And as you noted, many clsoed door meetings of boards with county officials that appear to violate the Brown Act or at the very least, the spirit of the law.